Manfredo do Carmo was a Brazilian mathematician working in differential geometry. 1978 he was an invited speaker at the ICM in Helsinki, and 1971-1973 he was president of the Brazilian Mathematical Society. Besides for his mathematical research he was also known for his textbooks. Die Wikipedia veranstaltet jährlich einen Schreibwettbewerb (link). Es gibt jeweils einen Jurypreis und einen Publikumspreis, und dieses Jahr ging der Publikumspreis an einen mathematischen Artikel: Mathematik in der Blütezeit des Islam. Ein paar mehr Infos gibt es auch in diesem ScienceBlog: link. The problem From the usual Euclidean plane we form the following graph: the points of the plane are the vertices of our graph, and two vertices are connected by an edge if they are exactly unit distance apart. The so-called Hadwiger-Nelson problem is to compute the chromatic number of this graph, i.e., the least amount … Continue reading "Chromatic Number of the Plane is at least 5"
This is the first post of a series of posts in which we will eventually venture deep into the realm of coarse geometry. But we will always be motivated by questions which are related to the one that we will discuss here. But our first steps into coarse geometry will be very gently: we will … Continue reading "Norms of infinite matrices"
John Roe, the founder of coarse index theory, passed away last month after a long fight against cancer. His web page is still online ( http://sites.psu.edu/johnroe/ ) and can be visited to get a glimpse not only of his mathematical work, but also of his personal life and all the things in the world that … Continue reading "John Roe 1959-2018"
A new paper proves the contractibility of the space of constant curvature metrics on all 3-manifolds except possibly real projective space. 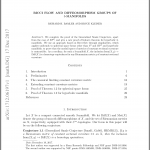 Bamler, Kleiner: Ricci flow and diffeomorphism groups of 3-manifolds, https://arxiv.org/pdf/1712.06197.pdf The Smale conjecture in its original form asserted that the diffeomorphism group of the 3-sphere deformation retracts onto O(3), the isometry group of its … Continue reading "What’s new on the ArXiv: Ricci flow and diffeomorphism groups of 3-manifolds"
A preprint with a new example shows that the understanding of infinitely generated Kleinian groups will be more complicated than for the finitely generated ones. 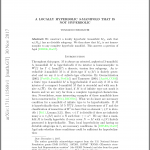 Cremaschi: A locally hyperbolic 3-manifold that is not hyperbolic, https://arxiv.org/pdf/1711.11568 By the proofs of hyperbolization and tameness, one knows precisely which irreducible 3-manifolds with finitely generated fundamental groups admit hyperbolic … Continue reading "What’s new on the ArXiv: A locally hyperbolic 3-manifold that is not hyperbolic"